This piece is highly unusual in several ways: it is very heavy; the shape, which appears to be a hybrid between a tripod incense burner and a flower pot with pierced base, does not seem to be functional; the glaze is unusually opaque; the handles are strangely shaped and surprisingly thin in relation to the otherwise sturdy potting; and the legs do not have the well-known paw shape and are oddly hollowed out underneath. Yet the type has close counterparts from a documented historical context and appears to represent a late product of the Longquan kilns. The piece is heavily potted, with a globular body with pierced base, straight neck and everted rim. It has a low, narrow circular foot, but is supported on three bulbous legs, which are sturdily potted and hollowed out on the inside, with small feet. Thin D-shaped handles are attached on either side. 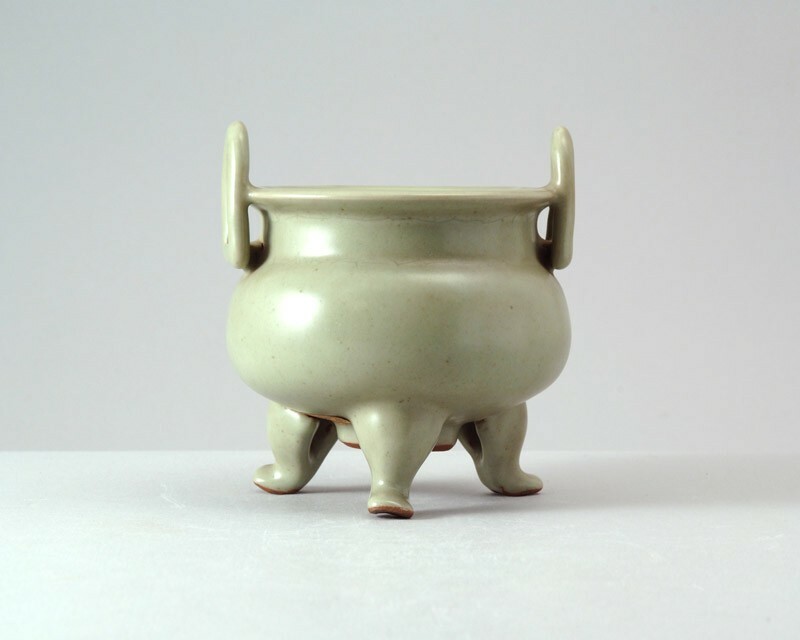 The glaze is unusually opaque, almost like Jun ware, of a light, milky-green tone, the undersides of the legs and the circular foot are revealing a brown-burnt biscuit. The glaze has burst open in the firing near one foot.